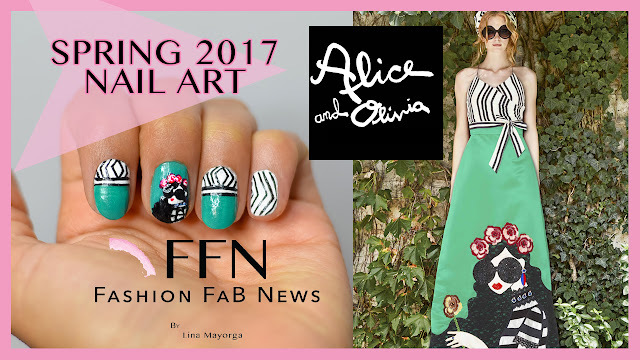 ALICE + OLIVIA SPRING 2017 INSPIRED NAIL ART | Fashion Fab News - fashion, beauty, celebrities, designers . 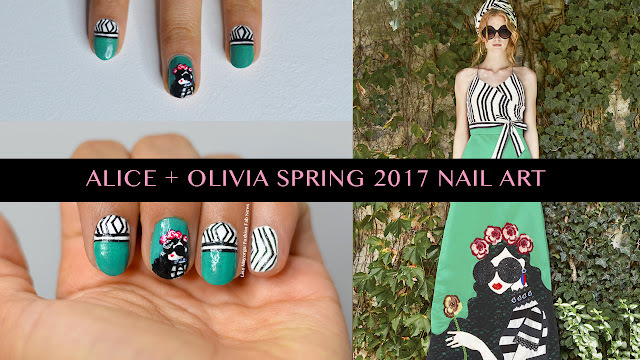 I decided to upload my first nail art tutorial on Youtube yesterday, but I also knew that some of you would like to see a written tutorial of my Alice + Olivia inspired nails here on my blog. 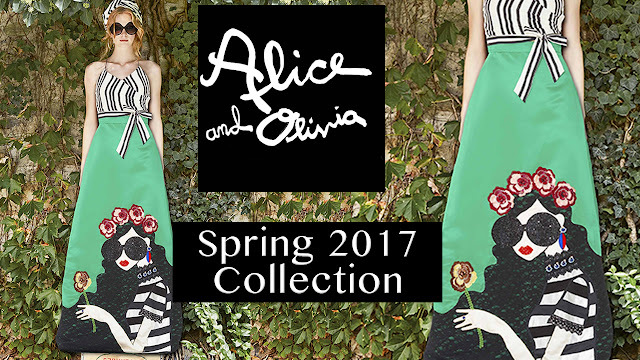 I chose this dress from Alice and Olivia's Spring collection because I think it is really beautiful, cute and colorful. This brand always has the perfect prints and color palettes for nail art. 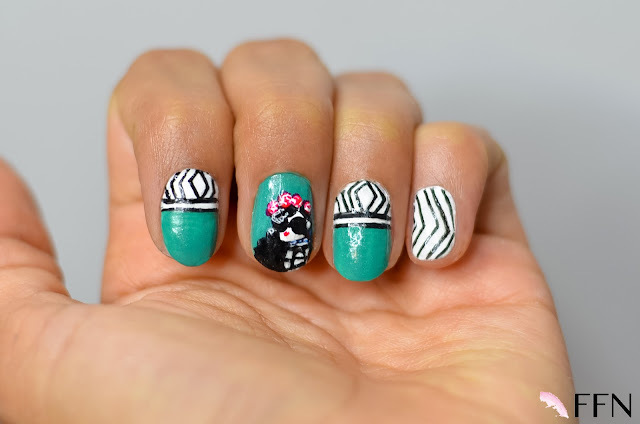 The design for the middle fingernail is the most important one on our nail art and the one that takes the longest, but the results are worth it. 1. Apply a clear base coat. 2. 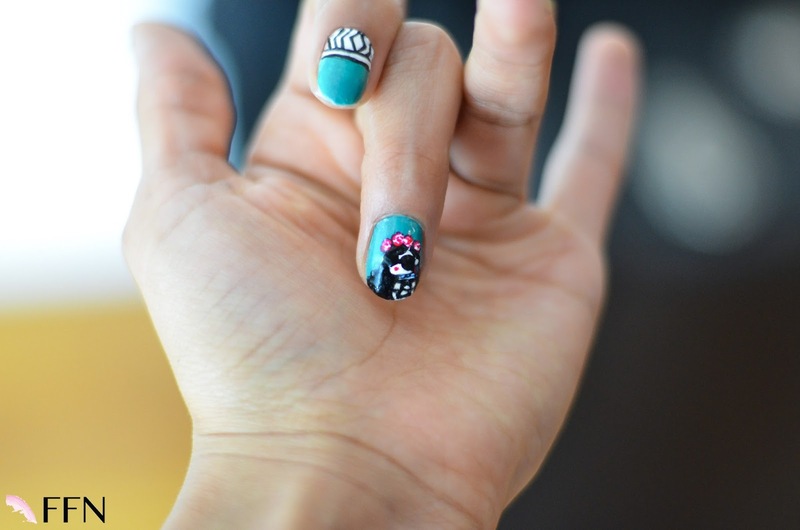 Apply two coats of the green nail polish on the middle fingernail. 3. Apply 2 white nail coats on your pinky, thumb, ring, and index. 4. With the same brush that comes with the green nail polish, paint the bottom half of the index and ring fingernails. 5. With a dotting tool, place a dot on the middle fingernail to paint the head of the doll ( woman ), extend the white nail polish of the big dot to create a neck and with a small flat brush paint her shirt/body. 6. Use a striper and black nail polish to paint the stripes on her shirt. 7. 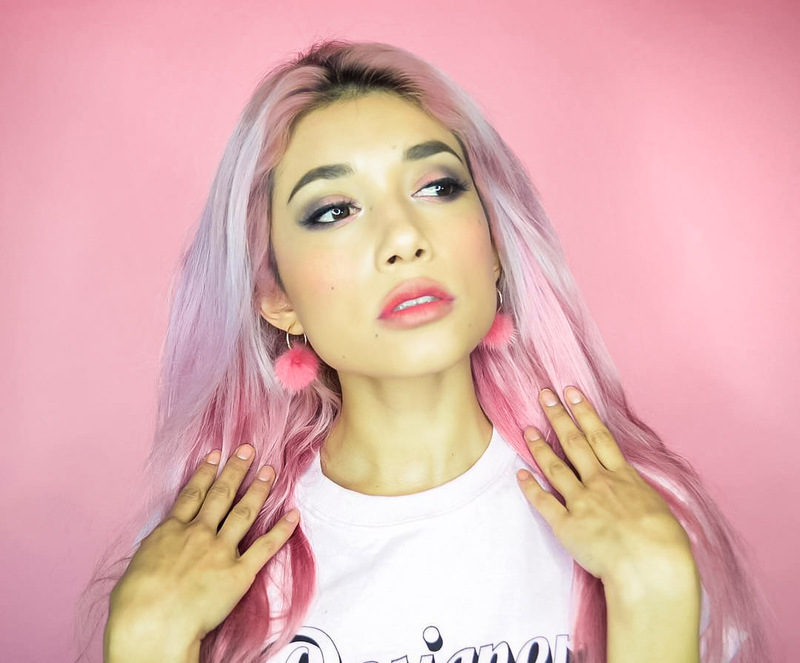 Paint her hair with black nail polish around her body with a small brush and her sunglasses with the black nail polish's brush by placing two dots together on her face. 8. On the top of her head, paint 5 white dots with the dotting tool. 9. With a red nail polish, paint her lips, earing and outline the dots on her headband to make them look like flowers. 10. 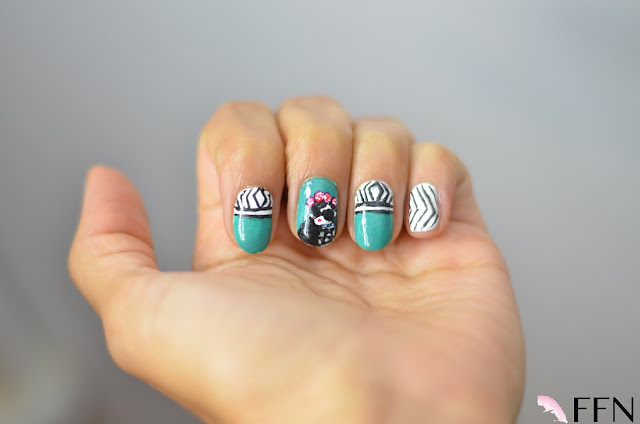 Your index and ring fingernails have the same design, so paint two black horizontal stripes and half diamond shapes above them. 11. For your thumb and pinky, paint half diamond shapes going on different directions in black. 12. Protect your design with a top coat.